Report from the Manchester Evening News, 16 June 1897 with added illustrations. A terrific gale suddenly sprang up at Blackpool shortly after three o'clock this morning. Shop and house windows along the promenade were blown in, and the wind did much damage to visitors' belongings. Advertising and other boards wore blown about. The most serious aspect of the storm is in its action in relation to the Foudroyant, Nelson's old flagship, which has been anchored off Blackpool for show about ten days, and which has been largely visited this Whitsuntide. During the calm weather pleasure steamers anchor a mile or two off the shore, and the Foudroyant had joined them. When the storm showed itself so suddenly this morning the steamers made for Fleetwood, but the warship could not get away, and she began to drift. During the night Foudroyant's anchors held, but about seven o'clock this morning she commenced to drag, and amid considerable excitement among a large crowd assembled on shore she drifted towards the North Pier. Eventually she struck in about 14 feet of water, then being right the middle the bay, opposite the Hotel Metropole. The heavy seas soon heeled her over, and as the depth the water increased wave after wave dashed over her. At the time of wiring, the battleship was further drifting in. It is not unlikely she will become total wreck. 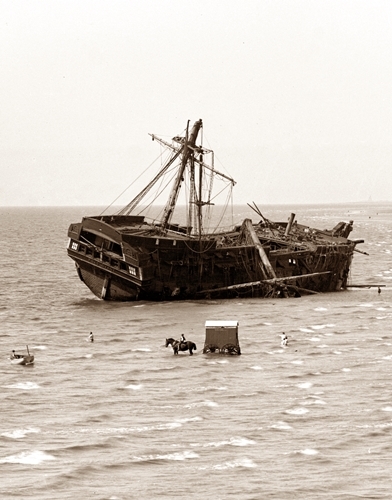 Nelson's old flagship, The Foudroyant, wrecked at Blackpool, June 1897. The Foudroyant is an 80-gun two-decker, and was launched at Plymouth in 1798 as Nelson's flagship. She took part in the operations at Naples, and Nelson left her on returning to England in June, 1800. The Foudroyant's active career terminated in 1812, and in 1892 she was sold out of the service to German shipbroker, who intended to break her up for firewood. There was such an outbreak of indignation, however, at the old battleship passing into German hands that the present owner paid £6,000 to bring her back to England, and considerable sums have since been spent in refitting her. She came to Blackpool few weeks ago from Birkenhead, and has attracted much attention in various districts, and she was shortly to have been removed to Douglas. A later message says:—Both boom and first mast have gone overboard, and she is full of water. The men are still on board, and it is said that the boys who compose the band were taken off early this morning. The lifeboat is held in readiness in case of necessity. The promenade is crowded with visitors, and there are good number on the North Pier. When the tide goes back the vessel will be stranded. 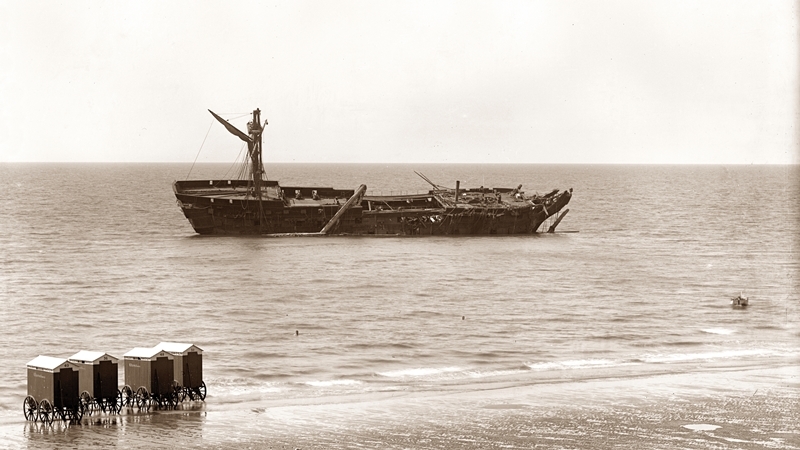 The wrecked Foudroyant, viewed from the sands, Blackpool, June 1897. Blackpool, One o'clock. Viewed from the North Pier the vessel looks completely waterlogged and embedded in the sand. The men, still on board, can seen waving their hands, and is evident that they appreciate the gravity of their position. The wisest course is felt to be to wait until the tide has gone out. Then they will be got off it is expected about 4.30, and every preparation is being made at the Blackpool hospital for their reception. All the masts and rigging have gone, and everything is hanging over the side of the ship, and the old man-of-war at this moment presents a sad sight. All the water round the vessel is covered with wreckage. It is said that Captain Seed offered to take the vessel in tow when the storm was rising early this morning. Other steamers also offered their services, but the captain of the wrecked vessel said that knew the Blackpool coast well enough. The wrecked Foudroyant, viewed from North Pier, Blackpool, June 1897. The sea presents a splendid spectacle as seen from the Pier, as the waves dash the hulking under the promenade. The North Shore works [new sea defences seen in the photo above] are feeling the full force of the storm, but up to now no great damage appears to have been done as the lower wall is practically completed. The people who are walking about the streets have great difficulty in getting along, the wind being so strong. There is also schooner ashore Norbreck, three miles from Blackpool. RESCUE OF THE CREW. The lifeboat was launched quarter to two, amidst the cheers the crowd, and after some difficulty reached the vessel and rescued the crew of twenty-eight men and boys, landing them on the north shore. The crew had some difficulty in making their way through the crowd which had assembled the promenade. They were taken away in cabs as soon as possible to the Wellington Hotel. Most of them looked fatigued after their severe experience, but none were in any way injured, although two or three were so much exhausted that they had be carried to the vehicles. This is the third time the new lifeboat has been used for saving life. She has behaved herself admirably throughout. EXCITING LIFEBOAT RESCUE AT FLEETWOOD. At Fleetwood two barques and the steam flat Elizabeth and Alice were driven ashore on Pilling Sands. A tug I boat saved three of the crew of the flat, and the lifeboat and tugboat proceeded to the rescue of the crews of the Norwegian barques. At ten o'clock this morning the storm was increasing, with rising tide, and it would be some hours before the lifeboat could return, as the vessels were several miles from Fleetwood towards Glasson Dock. Later. The lifeboat rescued and landed the crews of two Norwegian barques, the Svallin and the Louisa, and the steamflat, Zillah, at half-past one. The total lives saved number 18, including the pilot Gerrard, of Fleetwood. The boat was out over five hours. The rescue work from the Zillah was within mile of Fleetwood Promenade, and was watched by thousands of spectators, the taking off of five men from the rigging and funnel causing great excitement. The sea broke clean over the steamer and the lifeboat.